Hiking on European long distance trails helps getting knowledge of the variety of nature and landscape and for the intercultural exchange. 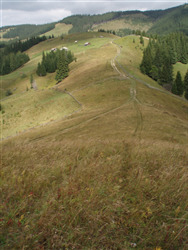 Primeval forests and other open spaces with high biodiversity find out an additional esteem by the ecological tourism. The ecological projects which are involved locally in the preservation of nature and offer environmental education give hikers deep insights into the natural resources and into the conflict fields in the surrounding oft he forests. The non-profit organisation Ostwind e. V. sees itself as an initiator for the interlinking of groups of the nature conservation and the protective areas, of the close to nature forest management, the ecological tourism, the environmental education and of the sustainable regional development to realise together the European primeval forest route. First it is obvious to connect the beech primeval forests in the UNESCO-world nature heritage from the German Baltic coast to primeval forests in Brandenburg, Hessen, Thuringia and to virgin beech forests in Slovakia and in the Ukrainian Carpathian Mts by a long distance hiking route. 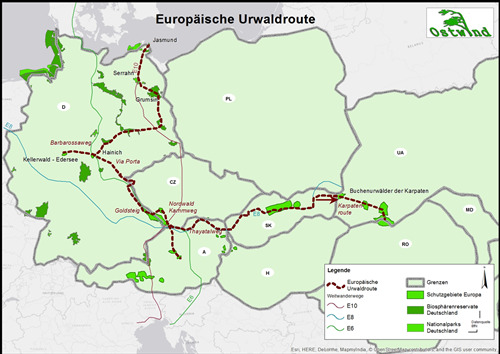 Partially the route runs along the former border area of the iron curtain, in the green belt, connecting further primeval forests in the Czech Republic and in Austria. Ostwind invites regularly to planning meetings to discuss and agree on the route course with local partners. → Newsletter 2018 III von Ostwind e.V.